Telangana Government has decided to fill 2506 VRO, VRA, Other jobs through TSPSC. 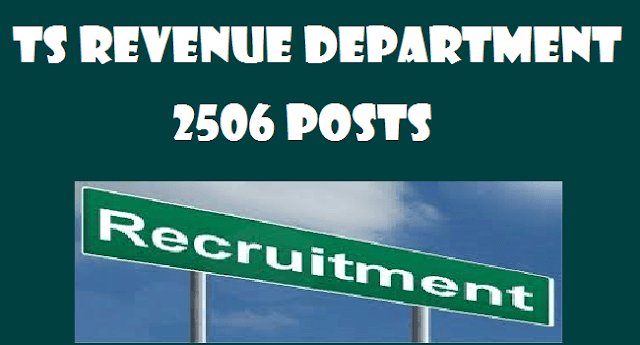 Government of Telangana has recently approved 2506 more jobs in Revenue department. This is really a very good news for all the Telangana Job aspirants. As of now only a notice has been released and official notification need to be released soon. The Telangana Government has on Saturday accorded sanction to fill up 2,506 posts in revenue department. The Chief Minister K Chandrashekhar Rao directed Chief Secretary SP Singh to make immediate arrangements to fill up these posts. Job contenders should posses qualifications like 10th, 12th class, Degree from any recognized University. Should own good knowledge in Type Writing to apply for Typist vacancies. Refer the original notification to get more information. Complete details about qualifications will be updated once the notification is released. Should have age limit of 18 to 44 years as on 01.07.2017. Relaxations in age may be applicable for reserved category candidates as per the govt rules. Application Fee: Details about examination fee will be updated shortly. Job seekers who have applied for this Revenue Department Recruitment are going to be recruited on the basis of following terms. Got Direct Recruitment page and find the Telangana Revenue Department Notification. Click the Online application link provided on the website to fill the form. At last, submit the form and generate a hard copy of it for future use.